If you’re searching for a nursery look that’s relaxing with a hint of fun, then we’ve got just the thing. We’ve created our own, modern take on the traditional ‘woodland’ theme using neutral grey tones, subtle pops of colour and playful animal additions. 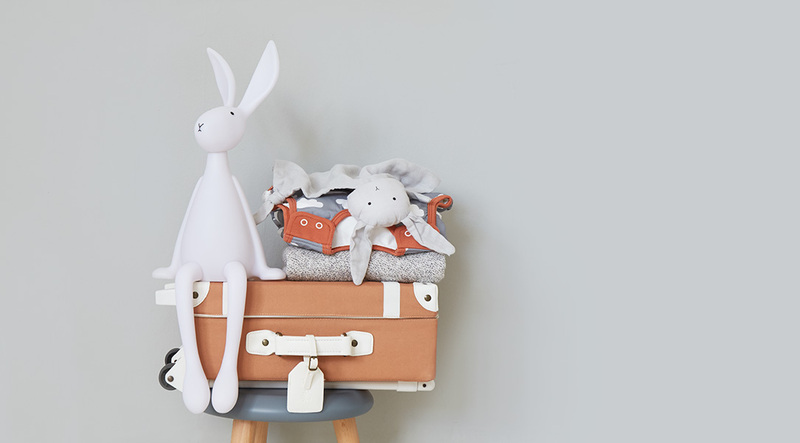 Here’s our tips for creating your own neutral woodland nursery. Start by picking grey shades that work in your space, but be conscious of how much light there is in the room. We used Grey Hints from the B&Q Colour range and added texture to walls with a fun wallpaper like this subtle bear paper from LivettesKIDS at Etsy. Create some woodland warmth with an accent colour. We’re loving warm rust and orange tones, like the colour of this retro Olli Ella Suitcase. Used as storage, it makes a great feature in a neutral room. You can’t have a woodland without the animals. 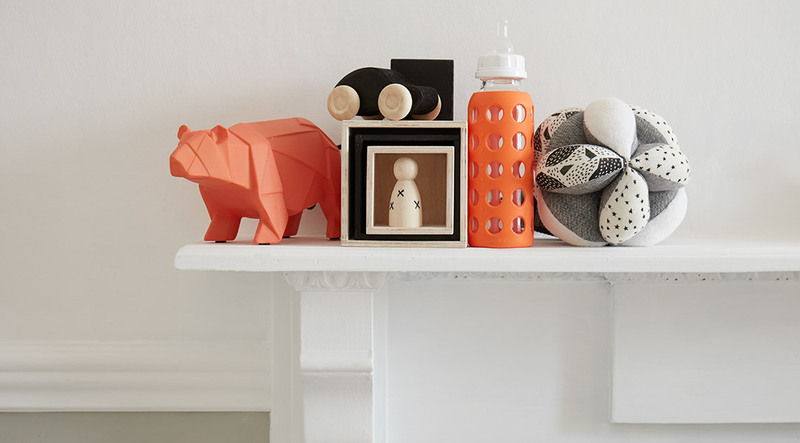 We love subtle options like this stylish Rose in April Joseph Bunny Nightlight and the House of Disaster Bear Lamp. Whilst The Bonnie Mob Bunny Blanket, with grabbable ears is perfect for night time comfort. Create texture with wood. 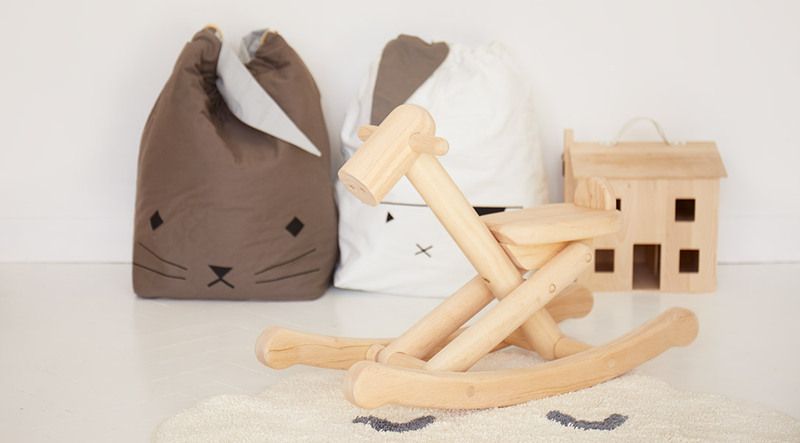 The neutral KIDLY Two Tone Cot is a practical way to introduce in wood, whereas the Plan Toys Foldable Rocking Horse is the perfect fun option. Simple and space saving, it’s a modern classic. Finish the look with complementary blankets and cushions. We love the rust trimmed Mama Designs Cellular Blanket and Cloud Sleeping Bag. 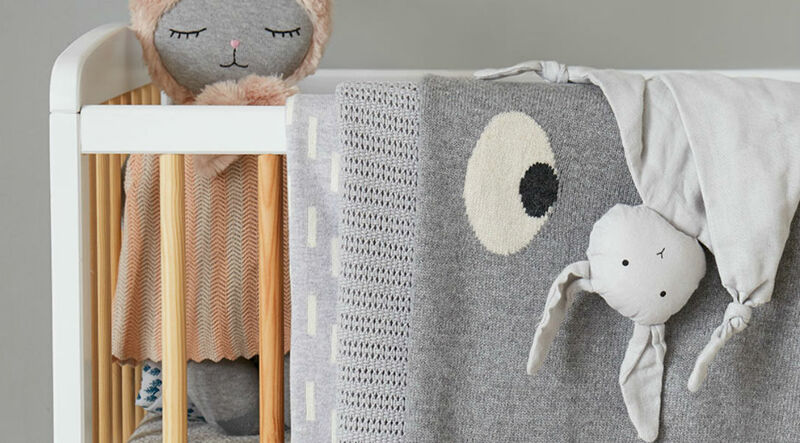 Add a soft print into the mix too with the Avery Row Grey Patterned Blanket.